The outbreak of spruce beetle infestation in north-central B.C. rose to record-breaking levels in 2017, and the latest government data shows no sign of the spread slowing. The outbreak of spruce beetle infestation in north-central B.C. rose to record-breaking levels in 2017, and the latest government data shows no sign of it slowing down. Aerial surveys revealed 340,000 hectares of forest are now impacted by the beetle — more than 45 times the pre-outbreak levels of 7,653 hectares recorded in 2013. "This is a significant concern," said Jeanne Robert, the regional forest entomologist for the Omineca and Northeast regions with B.C. 's Ministry of Forests, calling the outbreak "larger and more severe than we have seen in the past." Robert explained that spruce beetle outbreaks are normal, but changing weather patterns and warming winters are likely contributing to the severity of the current situation. 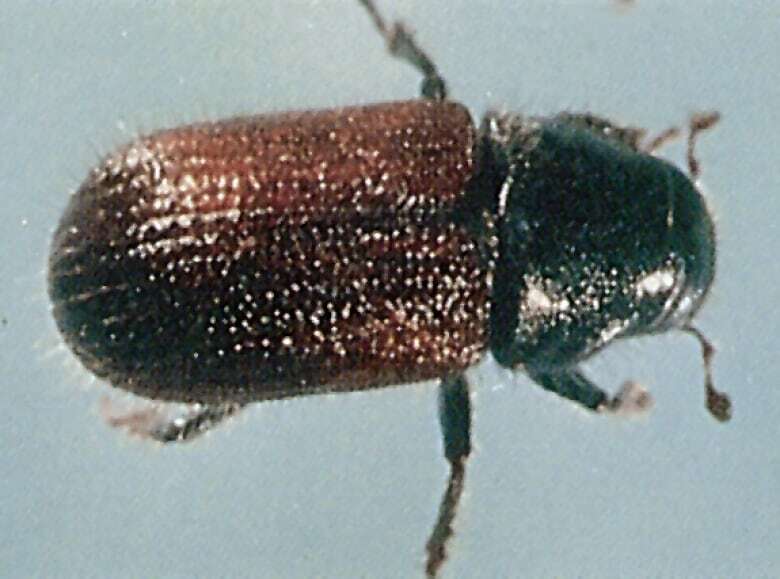 Spruce beetles are native to B.C., but normally only feed on fallen or weakened trees. Only during serious and prolonged infestations, do they become capable of killing healthy trees. The current outbreak was declared in 2015, after higher-than-normal spruce beetle numbers were recorded in 2014. Since then, the area affected by beetles has been growing exponentially. The current outbreak is centred near Mackenzie, approximately 200 kilometres north of Prince George. The infestation has spread north toward the Yukon border, west into the Smithers region, and east into the Robson Valley near the B.C.-Alberta border, as well as worsening in the Prince George-Mackenzie region. Robert said because spruce tend to grow in more ecologically diverse areas, the impact of the infestation likely wouldn't be as severe as the mountain pine beetle outbreak that destroyed over 18 million hectares of B.C. forests and continues to spread into Alberta. However, she said the spruce beetle did have the ability to affect the province's mid-term timber supply, which is the amount of wood available for forest companies to harvest in the near future. Robert said the immediate priority is to work with local governments and forestry companies to try and mitigate the effects of the outbreak by prioritizing the harvest of trees being affected by the beetle. However, while she said the spread of the beetle is likely to continue, "it's hard to say for sure what the overall impact will be."